Marco has had the pleasure of working with hundreds of education providers over the past 40 years. Through our exclusive partnerships, you can be assured you will receive the best pricing without the hassle of the bidding process! Marco has teamed up with Campus Service Cooperative as their enterprise-wide preferred provider of Managed Print Services (MPS). The new Minnesota State Colleges & Universities contract will assist the 31 colleges and 54 campuses in the MnSCU system in the designing, implementing and managing of print solutions to provide operational improvements and cost reductions. Marco will work to provide MnSCU all copiers, printers and multi-functional devices, and relevant accessories. As a vendor partner for Sourcewell, Marco has developed a program that allows all educational entities to benefit from the highest quality Sharp copiers, printers, and multifunction products at the lowest possible discount pricing. Marco is an authorized Sharp dealer for sales and service. 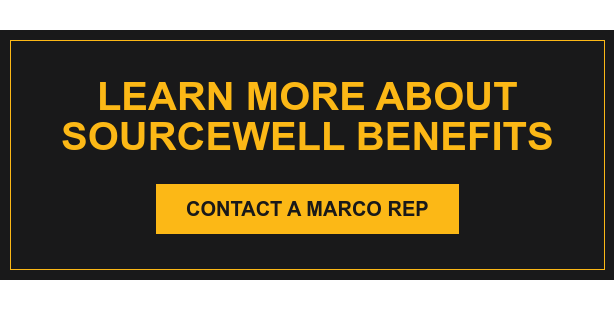 Marco also partners with Sourcewell and Mitel as a provider of telecommunications, wireless and related equipment and services. For more information about Sourcewell, contact Duff Erholtz at 218.894.5490 or visit Sourcewell's website. Marco has teamed up with E&I to provide the education industry with the best pricing HP printers and multifunction products and service. E&I is a not-for-profit buying cooperative established by members of the National Association of Educational Procurement (NAEP) to provide goods and services to members at the best possible value. The Cooperative is owned by its membership of more than 1600 colleges, universities, K-12, hospitals, medical research institutions and hospital purchasing organizations located throughout the United States. As a member of the Association of Educational Purchasing Agencies (AEPA), Marco can provide you with substantial discounts and expert service on Konica Minolta's full product line of color, black and white, and production copiers and printers.